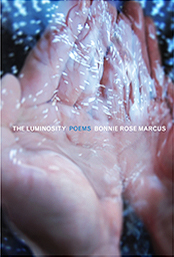 A poignant and touching poetry book, The Luminosity was inspired by poet Bonnie Rose Marcus’ visits to women and men in home hospice, hospice units, as well as in nursing homes. Her poems are intimate portraits of their dying—threading the gritty reality with the transcendent. Each poem reveals a deep connection made between the poet and those dying as they both balance upon that fragile precipice between life and death. Marcus brings us face to face with José, who has “skin like a child…but without a footprint”, and Dr. Singh, whose life inspiration was Dr. Martin Luther King, Jr. We meet Jazzman, of the “lean tune” who croons “…this is my last…be ba be bop…hands on keys…”, and Randee of the still clear eyes who “lived a good life.” We recognize a host of other people as we witness the delicate moments and charged seconds between life and death. These particular deaths illuminate for the reader a profound continuity. These are strangers we come to know intimately— yet in their last moments— through the genre of poetry. As person and poet, Bonnie Rose has ventured more than halfway across the bridge. In The Luminosity, she brings us with her—through images, and details, and extraordinary forms, adding even personal family stories that beckon us closer. Bonnie, your luminous book arrived last week, and I entered the space, not knowing what to expect (take a deep breath/into the luminosity/open), and I surely needed that deep breath. My admiration and praise go out to you for your accomplishment, for your skill as a writer, your innate compassion, and your ability to realize each of these beings in their living and dying. I can’t think of any other writer who would not have gotten in the way of this material. But even to say ‘material’ makes it seem heavier than it is. It is luminous. I hope sometime to have a chance to talk with you about your work (as a writer and an end-of-life guide). For now, congratulations on your book. I know it ‘will be of benefit’. 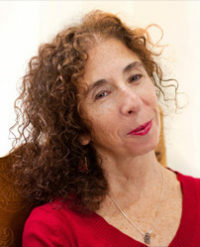 Bonnie Rose Marcus is the Director of Readings & Workshops Program (East) and Writers Exchange at Poets & Writers, Inc., in New York City. As a poet, Marcus’ poems have been published in Salon, Barnard College Chapbook, Brooklyn, and Miss Fit’s Free Press, a zine of the 90’s which she created with artist Vincent Salas. She has been invited to perform her poetry at ABC No Rio, Playwright’s Horizon, Cornelia Street Café, and Boricua College as well as at the Third Annual Midwest Literary Walk, in Michigan; The Salon, in Taos, New Mexico; and Split This Rock Poetry Festival, in Washington, DC. As an actor, she has numerous credits, including the Off-Broadway Show, Tony N Tina’s Wedding. Marcus is a hospice volunteer and facilitates classes in Meditation and Buddhist studies through Rigpa, an international organization of Buddhist Centers, under the guidance of Sogyal Rinpoche. She is a graduate of the Contemplative End-Of-Life Certificate Program offered by Rigpa’s Spiritual Care Education Program and Naropa University’s School of Extended Studies. An Educator with Rigpa’s Spiritual Care Education Program, she facilitates workshops on Meditation, Compassion, and Contemplative End-Of–Life Care.